WTF: What's the Story With the Stairway to Nowhere at UVM? The mint-green concrete steps behind the University of Vermont's stately Williams Hall are akin to bad plastic surgery on a beautiful person: They aren't pretty. The larger question is why they exist. The nine steps on the backside of the ornate 1896 building lead to an empty landing facing a brick wall with no doors or vestige of doors. It's a stairway to nowhere. After a reader brought this mystery to our attention, we walked up to the university green on an unseasonably hot September afternoon to stake out the stairway. Surely its reason for being would become clear under direct observation. On the scene, students were observed passing singly and in packs, their supple young minds apparently oblivious to the riveting curiosity within eyeshot. No one set foot on the stairway. A large construction crew was working to transform a pit between Williams and the Cook Physical Science Building into UVM's $104 million STEM complex. They, too, ignored the stairway to nowhere at 72 University Place. Around the pit, dump trucks beeped in reverse and diesel engines moaned. Bulldozers scraped the earth to give rise to a new campus edifice. But what about the pointless stairs on the magnificent old edifice already soaring toward the sky? Didn't the construction crews want to idle their cranes and apply their engineering know-how to ask, "WTF?" That left us to wonder and investigate. Cyber-forensics (i.e., a quick Google search) revealed that a metal fire escape on the south side of Williams Hall, around the corner from the stairway to nowhere, might hold a clue. Student bloggers have named that fire escape the "best make-out spot" on campus because of its views of Lake Champlain — and, one assumes, the sneaky thrill of sucking face where bad moves could result in falling several stories and splatting on the ground. Hmm. Could our stairway to nowhere have been connected to a second, now-removed metal fire escape? A fire escape that was torn down because the one on the south side already meets student make-out needs? Implausible. We left the shade and ascended the stairway to nowhere to the landing ... at nowhere. Close examination showed no evidence of a fire escape having ever existed there. Frustrated in our investigation, we paused to appreciate the building itself. From the gargoyles on the gable parapets to the grand arched entrance to the terra-cotta trim, Williams Hall is a striking structure. 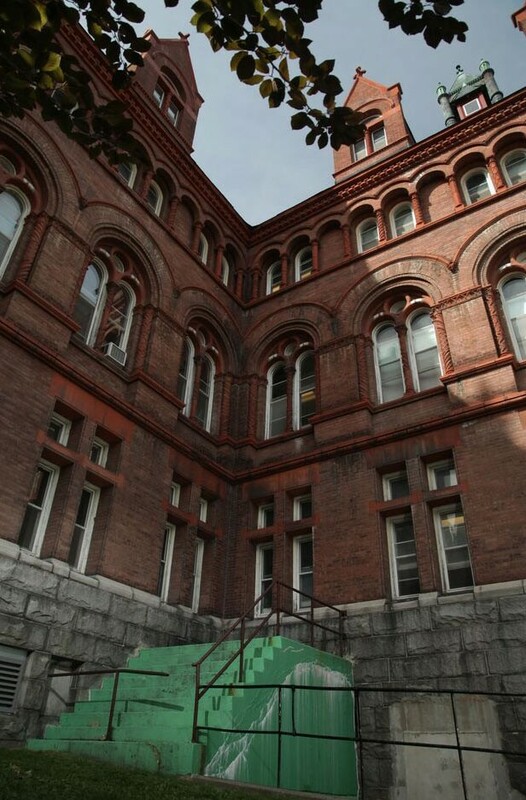 The building features almost no wood (with the exception of window trimming) and was considered one of the most fireproof buildings in Vermont when it was constructed in the wake of several prominent building fires on the UVM campus. The structure is named for the Philadelphia couple who paid for it: locomotive king Edward H. Williams and his wife, Cornelia. Originally designed as a science hall, it is now home to the art and anthropology departments. Could the stairs and the landing have been built to hold a statue of Williams, thereby honoring his generous bequest and inspiring present-day potentates to part with large sums for new building projects? As we pondered this possibility, someone came out of the building. He looked like he might work inside. "What's the deal with the stairs?" we asked. The man was Bruce Trudo, a facilities repairman who has worked at UVM for a dozen years, and he had an answer, or at least part of one. The concrete cube supporting the stairway does have a reason for being on the back of the building. "That's the electrical bunker," Trudo explained. The bunker, which is accessible from the bowels of Williams, contains a transformer. As for the stairway built on it, however, Trudo was clueless. "Why the stairs were ever there, I have no idea," he said. Hoping to find the answer at the source, we approached several people in the UVM buildings department. Michael Richards, facilities information analyst, studied old drawings for clues. It appears that the bunker, or transformer vault, was added to the building around 1960, he wrote in an email. The east wall of the vault was supposed to have an exit, and so was the landing atop the vault. That might have justified the stairway — but, for some reason, neither egress was built, and the finished bunker deviates from the plan. "I could not find anything as to why they did not construct it as originally designed," Richards wrote. So the stairs' function remains a mystery — or a casualty of forgotten circumstance. What about their distinctive mint-green shade, which has been painted over here and there with swirls of lighter green? Turns out graffiti artists like to express themselves on the stairway. Maintenance people paint over their handiwork. "People would do their little artwork all over that thing," said Trudo, pointing to the various shades of mint on the bunker. "So we painted it some more green. That's not even a UVM green per se," he noted — indeed, it's several shades lighter than the school color. "It's just green."